2012, at Wembley Stadium in London. 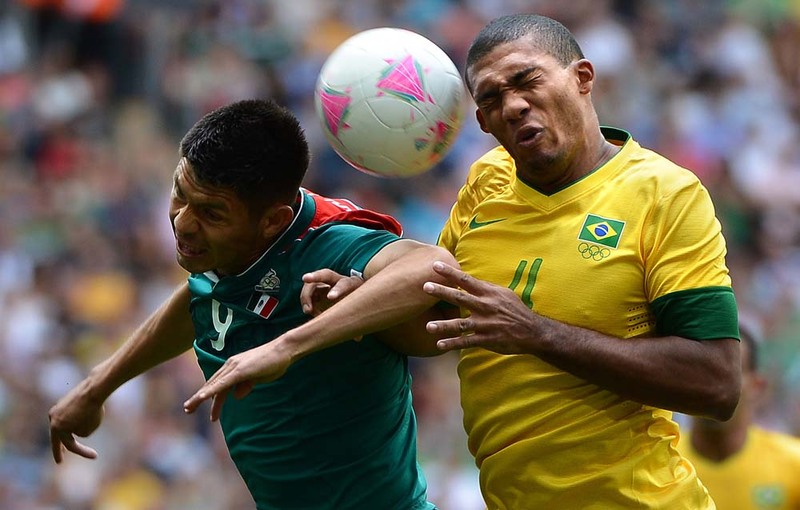 Mexico topped Brazil by a score of 2-1, as Peralta scored twice. Rarely does a country have the opportunity to host a FIFA World Cup, and rarely does a country have the opportunity to host the Summer Olympic Games. Even more rare, and almost unprecedented, is the opportunity to host the World Cup and the Olympics only two years apart. This is the opportunity that Brazil will have when it hosts the 2014 World Cup and the 2016 Summer Olympics in Rio de Janeiro. Brazil is the first country to host the two mega sporting events consecutively since the U.S. hosted the 1994 World Cup and then the 1996 Olympics in Atlanta. Both the World Cup and the Summer Olympic Games are held once every four years, and with the way the events are scheduled, the two occur interchangeably with two years between. Exactly one year from this month, the World Cup will kick off to much anticipation and hype. The host country will certainly field a strong team with a chance to win it all on the foot of its superstar forward, Neymar. In one year, Brazil will look to begin its two-year transformation from crime-ridden, poverty-stricken South American land to “the country of tomorrow” and an international power leading the emerging South American countries to a position of respect. It is a grandiose plan, indeed, the kind of long-term vision that is inherent with winning the bid to host mega sporting events. Brazil, though, is facing issues more immediate than the exorbitant costs of hosting mega sporting events during trying economic times. The people of Brazil are protesting the excessive government spending and corruption in connection with the events, and they are not backing down. This is how mega sporting events work, though. Event organizers act as what is often referred to as a “neoliberal Trojan horse” because of the way they dictate a government’s policy leading up to the event, while placing the monetary burden squarely on the shoulders of the taxpayers of the country. In the event of the 2014 World Cup, FIFA has gone into a Brazil that is already ravaged by poverty and slow economic growth. Brazilians simply cannot handle the increased burden. By the middle of June, the message of the protesters had been heard. Brazilian President Dilma Rousseff overturned the fare increase in attempts to restore peace within the country. The nonviolent protests had begun to take an ugly turn toward violence, so the government was forced to give in. Despite the overturned fare increase, the protests continued into the Confederations Cup that ended in June. The Confederations Cup is essentially a warm-up tournament that is held the year before the World Cup for national teams to prepare and for the host country to have a lower-level run-through of what it will face. Brazil, the host nation, beat Spain in the championship June 30. According to BBC News, Rousseff did not attend the Confederations Cup final after being mercilessly booed by the home crowd in the opening round. Out on the streets, thousands of Brazilians who were not among the 50,000-plus inside the stadium for the final match aired their grievances against the government and against FIFA. After getting the fare increase overturned, the masses demanded an end to the political corruption; the resignation of Sergio Cabral, governor of the state of Rio de Janeiro; and improvements to the aforementioned health care, education and public transportation systems. The protests again planned to be nonviolent, but some took a violent turn. As the 2014 World Cup and the 2016 Summer Olympics near, Brazil is in a battle with its own citizens more so than the normal trials and tribulations that come with hosting a mega sporting event. With the original goal of becoming “the country of tomorrow,” Brazil’s revised goal might simply be to avoid disaster.